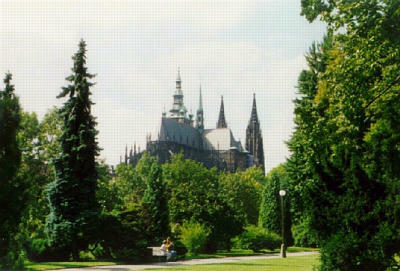 St Vitus’ Cathedral is the most spectacular and best known part of the Prague Castle complex. Construction began in 1344 and was completed an astonishing six centuries later, in 1929. 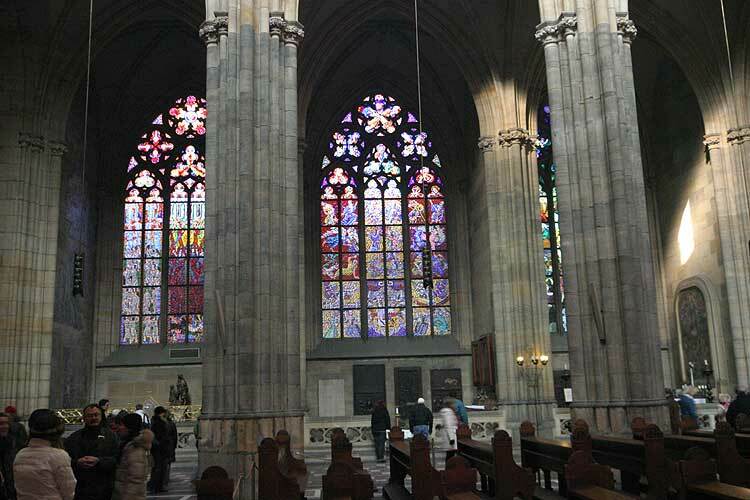 This Gothic Cathedral is the ceremonial and spiritual hub of Prague: it houses the tombs of Czech royalty, relics of local saints, was used for coronations and is home to the Crown Jewels. Its founding father was the prolific Charles IV, who commissioned it when he succeeded in having Prague elevated from a mere bishopric to an archbishopric. 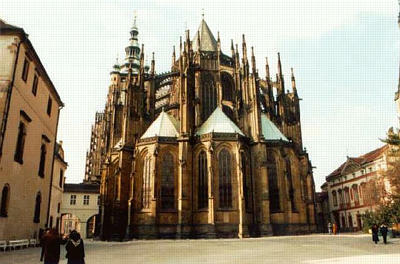 St Vitus’ Cathedral is built on the site of an earlier rotunda, also dedicated to St Vitus, dating from 925. St Vitus had been chosen as the patron saint of that rotunda by Wenceslaus I, (known to English speakers as Good King Wenceslas) because he had just been given a prized holy relic of St Vitus by Henry I – Henry the Fowler, the Holy Roman Emperor at the time. The relic? One of St Vitus’ arms. Wenceslaus is the patron saint of the Czechs and the ruler responsible for transforming the Bohemians from pagans to Christians. Charles IV himself was to become Holy Roman Emperor shortly after commissioning the Cathedral, thus cementing Bohemia as a major player on the European Christian stage. The apse of the earlier rotunda was incorporated into new St Vitus’ Cathedral as it contains the remains of Wenceslaus. The original designer of the Cathedral that you see today was Matthias of Arras, chosen by Charles IV because he was French and Charles IV had a special affection for all things French owing to his French education. St Vitus’ Cathedral is Matthias of Arras’ greatest work, although he is also the probable architect of Karlstejn Castle. The French influence can be seen in the extreme narrowness of the Gothic columns which you can see on the eastern face of the Cathedral, the opposite end from the main entrance. On the death of Matthew of Arras, Peter Parler was appointed to complete the work. Parler, only 23 at the time, was to become Charles IV’s favourite architect and was also responsible for the Charles Bridge. He completed the choir and the Wenceslas Chapel on the south side according to Arras’ designs, then continued in his own style. The vaulted ceiling above the choir is a Parler innovation. The style is called Net Vault because the ribs cross each other creating a net effect, which is structurally an improvement on the older vault structures and is also more beautiful, creating a feeling of space and light. This particular type of vault is also called Parler’s Vault. Parler also designed the windows such that no ornamentation is the same in any window. Looking closely at the sculptures in the triforium (shallow arches in the walls above the nave) you can see the faces of Czech royalty and the master builders, Arras and Parler. Peter Parler died in 1399 and his work was continued by his workshop, presided over by his sons and later by a master builder called Master Petrilk. However, in 1420, the advent of the Hussite War put a stop to any building. 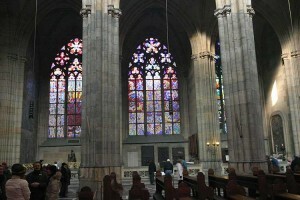 St Vitus’ Cathedral was plundered by both the Hussites and their enemies.